Today, I experienced what the kids call an ‘epic fail’. In the kitchen. Where I’ve spent thousands of hours in the last 50-some years. Let’s begin at the beginning. I’m hosting a dinner party in a couple of weeks. One of the menu items will be a vegetable lasagna (grilled eggplant, grilled zucchini, roasted red peppers, homemade marinara sauce, bechamel sauce, mozzarella and Parmesan (not homemade) and ricotta. The ricotta you get in the stores is okay, but I wanted something rich and fresher to round out the panoply of flavour layers in the dish. How hard could it be to make ricotta? It’s just curdled milk protein, right? 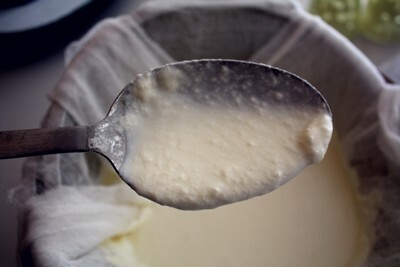 With recipes culled from the pages of Chow and Karma Cucina, I assembled my ingredients – four cups of 2% milk, two cups of whipping cream (yeah, I know that seems contradictory, but the recipe said…), 1 teaspoon of kosher salt and 4 tablespoons lemon juice. I heated the liquid gently in an enamel pan, until little bubbles appeared around the edge of the mixture, stirring so that a disgusting burned-milk crust didn’t form on the bottom closest to the heat. I added the acid (juice), stirred a few times and stood back to watch the miracle of curds forming (which is what I was told would happen). Nada. Maybe I needed to heat it a bit more. So I cranked up the burner again, counted to 25 then turned it off. Dragged a skewer through to see if there were any curds of note. Nope. Tasted the leftover lemon juice. 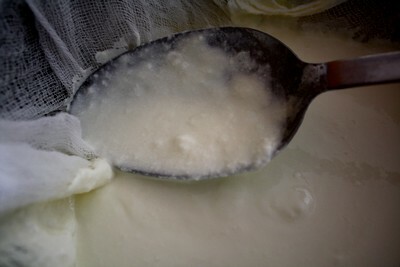 Not grimace-inducing, so perhaps it wasn’t sour enough to stimulate curd-forming. Rummaged through the cupboard to find some vinegar and measured out two tablespoons (if 1 is called for, why not 2, to speed things up). Gently moved the mass around in the saucepan to distribute and waited another 10 minutes. 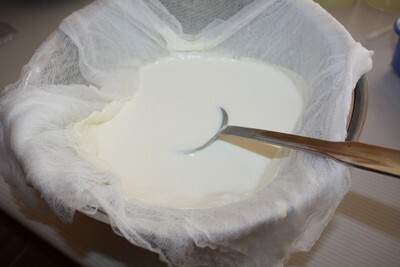 Used a slotted spoon to scoop up what should be nicely defined curds. Now, I’ve had my not-so-great kitchen productions – the ravioli that wouldn’t stay closed, so that the roasted butternut squash filling oozed from the too-thick pasta layers into the water, so that the whole thing looked like an explosion in a pumpkin factory, the coconut cream pie with too much cornstarch in the filling, that we needed an electric knife to cut through, the over-exuberant sourdough bread that spewed onto the oven floor and formed a nearly impenetrable barrier on the cooking element. Hey, if you don’t try, you don’t mess up and you don’t learn. But this bowl of ‘stuff’ didn’t resemble those mounded bowls of well-defined curds the cooking websites display. Nooooo, what I was reminded of was baby barf. That finely textured spit-up the little darlings surreptitiously deposit on the back of your shoulder as you’re burping them when they’re over-full of breast milk and rice cereal. Mothers, you know – the slurry someone else kindly tells you is smeared and smelling up that clean fleece vest you donned over your new yoga top before you dashed out to the supermarket. There’s salt, vinegar and lemon in it, so it’s not like I can recycle it with cheese and hide in scalloped potatoes. I’m not tasting it, either, seeing as the texture of cottage cheese on my tongue makes me nauseous. Luckily, the quart of cream was from Costco, so it actually cost less than the carton of milk I used. Back to the drawing board? Nah. Perhaps I shouldn’t have taken liberties with the acid proportions. Honestly? There are obviously some things that are better bought, than made. Maybe I’ll pour it in the garden, over the rose bushes that the rabbits are gnawing to the ground. See if it works as a repellent.